The Spring following a presidential election cycle is usually recovery time for campaign analysts and staff. It is not typically the time for races with potentially national significance to break out. But President Trump’s decision to name four House members to his cabinet have created opportunities. This past week saw a special election in Kansas where Democrats lost by seven points a seat that Trump carried by nearly 30 in November. That seat was never expected to get that close but Georgia’s Sixth Congressional District is. And the party feels that if they can’t win the seat outright on Tuesday – something the GOP is furiously hoping to prevent, they can do so in a June run-off. We shall see, we shall see. It’s universally agreed that election will be close which, in and of itself may send the shot round the world Democrats may be hoping for. But it’s not universally agreed to whether the Democrats preferred candidate, Jon Ossoff can seal the deal either Tuesday or in June. A descendant of a seat represented by Newt Gingrich, the Cobb/Fulton/Northern DeKalb district swung from 61% Romney to just 48% for Trump, 1.5% better that Clinton (a sliver of Cherokee County is also in the Sixth but that area is unambiguously Republican). There are 18 candidates (eleven Republicans, five Democrats and two Independents) in the race though the candidates given a serious chance of winning is no more than five. That one of those is a Democrat would have pundits spinning years ago but the fact that Ossoff, a 30 year old journalist/filmmaker now only has a shot but leads handsomely is considered a sign of the times. Prior to this year, Ossoff would have been an also-ran – a Democratic sacrificial lamb undertaking a kamikaze run in a bid to simply fill the Democratic line. 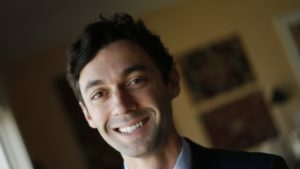 Now, national Democrats and energetic liberal backing have coalesced behind journalist/filmmaker Jon Ossoff, who has wowed astounding $8 million – more than all but three House candidates in the ’16 cycle- and leads in polls. But 18 Republicans are on the ballot and politician of all parties meet in a jungle primary on April 18. If no one receives 50%, a runoff will occur. The question is whether Republicans can rally around their eventual nominee, or if they will even need to. In contrast to Ossoff, the Republicans have no unity. Ex-Secretary of State Karen Handel was considered the early front-runner. 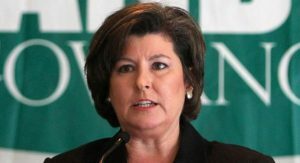 She very nearly won the 2010 Gubernatorial nomination, losing to now-Governor Nathan Deal by less than half a percentage point. But her efforts to become a U.S. Senator in 2014 did not go as well – she took just 18% and failed to advance to the runoff. The man who did win, David Perdue, has given his backing to State Senator Dan Moody, whom he calls “one of us.” Technology executive and John’s Creek Councilman Bob Gray is also nip’n’tuck. Handel has earned the enmity of the Club for Growth. who recently began running ads attacking her as a “big-spending career politician.” She has sought to rebut those charges Moody recently garnered the attention with an ad featuring elephants and donkeys – one of which sported a Pearl necklace which Handel often wears. Referring to manure, Perdue tells voters he’s “going to need a bigger shovel.” Handel, who has the backing of the man Perdue replaced in the Senate, Saxby Chambliss, responds with her husband saying, “Washington can’t handle Handle” and has touted her implementation of the state’s stringent voter i.d. law during her stint as Secretary of State to appeal to more hard-line conservatives. Gray is homing in on the conservative message. In an obvious attempt to woo Trumpers, one ad finds him armed with a water-pump in a lake, vowing to “drain the swamp.” State Senator Judson Hill is the other candidate in the race believed to have allowing, though he is not expected to land in the top two. If a runoff occurs – and recent polls have shown Ossoff from 39% to 45%, both sides will be looking at how close to 50% Ossoff gets. The GOP view is that with so many Republicans in the race, voters will consolidate behind whoever eventually wins the nomination. Therefore, the farther Ossoff gets from 50% would seem to make it more difficult. On the other hand, Democrats contend the party is energized like never before. One person admitted “the Republican side has been showing up to vote here for years, and we haven’t been energized,” said Melanie Manning, among the Democrats pinning her hopes on Ossoff. “Now we are. This election will be different.” Indeed, Democrats are energized by a wave of early votes that have been cast by their voters and unaffiliated. Republicans have been running behind but pulled about even as early voting concluded prior to the weekend. They will show up on Tuesday but the question is how many. Democrats also are concentrating their GOTV on Northern DeKalb County, which gives the Democrats big margins but where, unlike the other areas, did not have an early voting site in operation. The question is, would Democrats rather “handle” her, Gray, or Moody. Some think Handel’s lukewarm ratings among conservatives would cause a critical few to stay home. But she may have to answer to moderate Republicans as well for her tenure as senior vice-president at the Susan G. Komen Foundation which culminated in her resignation following the board’s decision to end breast cancer screenings at Planned Parenthood (the ban was reversed). They also believe Gray would cause enough Republicans to vote for Ossoff. But the district’s fundamentals as much as anything would be in play for June. Republicans are quick to point out that though Trump held the district by a mere point, voters re-elected Price by 24. In particular, he carried the four counties in the district even as Clinton was winning three). But with Trump in the White House, national issues are in play and Price, as among the leaders of the would-be Trumpcare, may be as much at the center of it as anyone else. Can Democrats take this district? We’ll likely know in June but for all of the energy, expectations and outright hope, I suspect it might be close but no cigar. But if last year taught us anything, it’s that anticipation is no longer the norm.